"The cost for us it is a pretty decent risk. But since we assume a great response and especially from our great fans, we see an event like this as a gift to the people." That's what Pardubice General Manager Zbyněk Kusy said back on November 11, when Open Air Hockey 2011 was in its planning stages. On Sunday, we saw that planning come to fruition when Eaton Pardubice defeated Kometa Brno 4-2 before 17,140 fans outdoors at Pardubice-Svítkov Speeday. It was the first outdoor professional hockey game ever played in the Czech Republic. I had standing ticket and that became the first nice surprise - I saw perfectly! The rink wasn't as far as I thought it was going to be. In the beginning of the game I was a little disapointed by the number of people who came but all the fans who showed up were so alive and excited that it didn't matter. 17 thousand is a lovely number. We didn't really trust the stability of the construction but it turned out well, even when we were jumping. (Just for fun, we counted the stairs - 98 exactly.) A snow storm came during the first period and I didn't feel my toes the whole game but I think these things kind of belong to it so I didn't mind. Brno fans can be very loud - and they were loud. But I could barely hear them after Pardubice tied the game. The organization was good, as well as the possibilities to buy some food (sausages, noodles and some Czech/Slovak specialties such as halušky or trdelník) or something to drink (tea, beer, rum, hot pear juice, etc.). Prices were acceptable. Buses and trains to Svítkov and back to the city were free. There was, I think, only one negative aspect - the visitors, who spent more money for seating tickets (600 - 5000 CZK) in order to see the match better, had a worse view than than the fans in the standing area had (500 CZK). All in all - Open Air Game in Pardubice was amazing. Everyone left Svítkov feeling a part of something special. I don't know if doing this every year would be a good idea but it was definitely the best hockey experince I've ever had. If you ever have a chance to go to an outdoor game, don't hesitate. During the 1st period started a little snow storm but since the second the weather went much better and the score as well . :) The Kometa fans were very loud in the first period (much louder than home fans, I must admit) but since the moment when Pardubice scored for the first time they only kept silence. Unfortunately, I could only see half of the rink because of the tower with a TV cameraman. But there were a screen above the rink so I didn't mind it. The match was a good experience and at least now I know that I have to wear at least two pairs of socks for outdoor matches, lol. We spent the first period in the standing sector and.. yes, there was the best view. Seriously. And it snowed, like a lot. Second and third periods we went to our seats and .. were freezing. 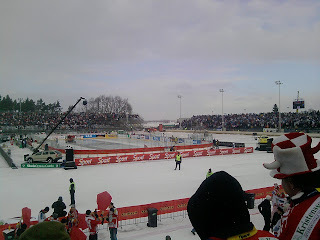 :) It stopped snowing and Pardubice tied the game but well, sitting on a cold bench is not the best thing you can do.